British actors-screenwriters Simon Pegg and Nick Frost have affectionately skewered zombie pics (Shaun of the Dead) and mashed up an English cozy mystery with a Hollywood actioner in Hot Fuzz. Now, in Paul, the pair indulges their sci-fi side, penning and starring in this buddy road comedy from Greg Mottola that puts a wise-cracking alien in the passenger seat. 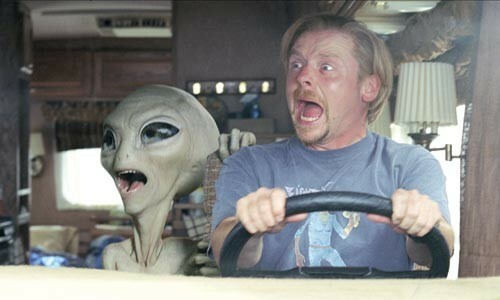 The nerdy Graeme (Pegg) and Clive (Frost), after visiting Comic-Con, head out in an RV for a tour of alien-encounter sites in the Southwest. They're flabbergasted -- then thrilled -- to pick up an actual alien, a shirtless green dude named Paul (digitally animated, with the voice of Seth Rogen). Paul's on the run -- he's being chased by a dark-suited agent (Jason Bateman) -- but he's so much fun, the two agree to drive him to a mysterious destination. In time, the trio is joined by a one-eyed Christian girl (Kristen Wiig), while their pursuers grow in number: angry truckers; more agents; the girl's shotgun-toting father. The slim plot is just a structure to hang jokes on, many of them winks and nods to the canon of sci-fi and alien movies, and the fanboy culture it perpetuates. Some are obvious or openly self-referential; others are subtle (like musical cues) and a reward for those with deep knowledge. Paul may be an alien, but he's familiar from countless other raunchy comedies: the hard-partying prankster who turns out to be a decent guy after all. The film is rated R mostly for profanity, and while Paul is a gifted cusser, the film's running gag about Wiig's character learning to curse was one of the few that fell flat. Paul may go on a shade too long (though it gets in a meta-joke about that), but it's a fun, if not particularly genre-busting, ride with lots of laughs and love for the self-professed geeky comic-book gang. Starts Fri., March 18.